Simple dinners are my specialty! 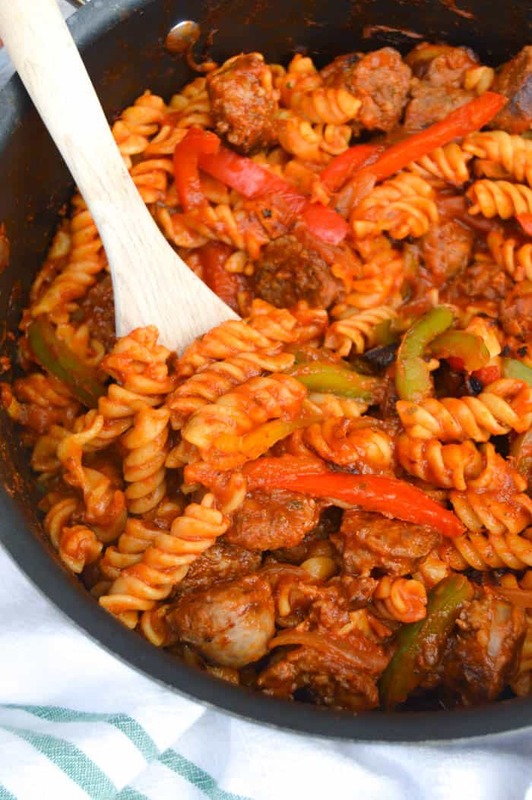 This Italian Sausage and Pepper Rotini is so simple to make and only leaves you with one pot to clean up after dinner. I love a simple dinner idea. 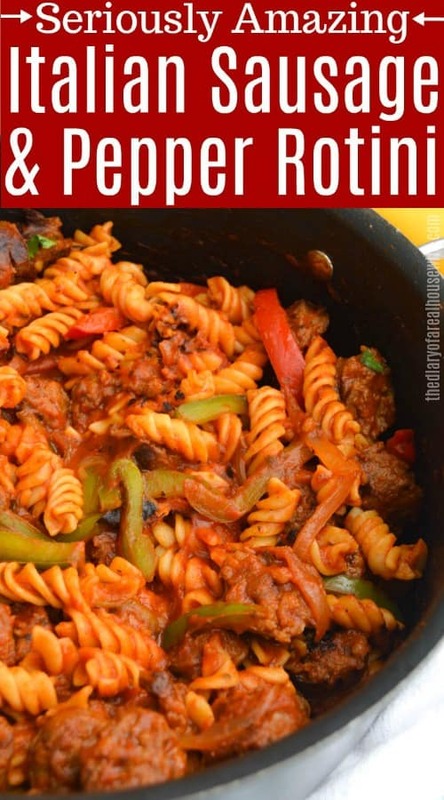 This Italian Sausage and Pepper Rotini is so simple with just a few ingredients and loaded with flavor. I didn’t add any extra spices or seasoning to this recipe. This the marinara sauce and the flavor of the sausage I really didn’t need any. Plus the mild flavors make it kid friendly in my home. I hope you love this simple rotini recipe just as much as we did. Check out even more of our favorite easy pasta dishes next. Step One: Start by cooking your rotini according to the package directions. Drain and set aside. Step Two: In that same pot that is now empty add in 1 tablespoon of olive oil. Cook sausage on each side until brown. Remove and cut into bite size pieces. Set aside. Step Three: In the same pot add your remaining 1 tablespoon of olive oil and then your peppers and onions. Allow to cook for 2-3 minutes until tender. Step Four: Place sausage pieces into the pan and cook until all pieces are cooked throughout. Step Five: Add in pasta and marinara sauce to the pot. Allow to cook for 4-5 minutes until warm through out. One Pot: for this recipe, I only used one pot but cooked it at separate times. I started with the pasta then drained it and left it in the strainer and use the pot again for my sausage then peppers. Once it was all cooked I added the pasta back into the pot. Even though it doesn’t all cook in one pot at one time it still makes it less dishes for after dinner. And I always love less dishes to wash.
Italian sausage: for this recipe, I used Italian sausage. I started by browning them then removed them and sliced them. If you try to slice them before browning they will end up falling apart. Bell peppers: for this recipe, I used a red and a green bell pepper. Any color you like will work for this recipe. Slow Cooker Sausage, Chicken, and Peppers: This is my mother in laws recipe that I just love. It’s so simple to make and you can serve it so many ways. On a sub roll, over rice, or pasta. It’s amazing. 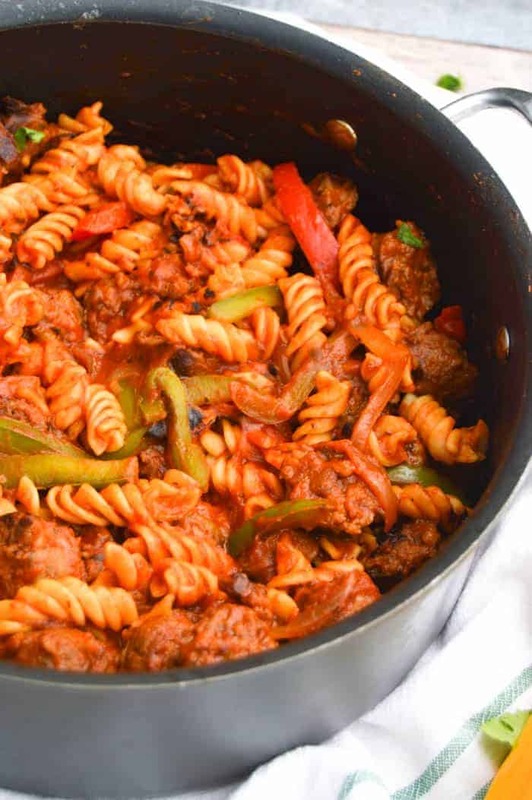 Italian Sausage and Peppers with Penne: This recipe is pretty similar to this one but I added some parmesan cheese and the kids loved it. Philly cheesesteak Stuffed Peppers: If you want a Philly cheesesteak without all the carbs try this recipe, so yummy and so healthy! Start by cooking your rotini according to the package directions. Drain and set aside. In that same pot that is now empty add in 1 tablespoon of olive oil. Cook sausage on each side until brown. Remove and cut into bite size pieces. Set aside. In the same pot add your remaining 1 tablespoon of olive oil and then your peppers and onions. Allow to cook for 2-3 minutes until tender. Place sausage pieces into the pan and cook until all pieces are cooked throughout. Add in pasta and marinara sauce to the pot. Allow to cook for 4-5 minutes until warm through out.